One final task remains before the First Seeker can realize her ongoing mission of returning to the Scoured Stars: recovering the key that can lower its shields. She has identified the key's location and assembled a team, yet the key rests on a barren moon in a dangerous complex filled with ancient traps from a technologically advanced alien species intent of keeping their relics protected against invaders. The PCs must brave the depths of this perilous repository and retrieve the key and unlock the Society's means of returning to the Scoured Stars. I really enjoyed this scenario, but, beware! This scenario is challenging! It’s got some good environmental challenges, makes use of an interesting new kind of radiation, fun battles, cool traps, and has a great pay off in the end. There was also some interesting back-plot that you can unravel as you progress, which I always enjoy. Definitely a combat heavy scenario, although some battles can be avoided by clever PCs. The boons were interesting but not overly exciting. This is primarily a combat- and dungeon-exploration scenario that doesn't have much to offer in terms of role-playing. Although the dungeon layout is clever and there's some interesting background that ties well into the present, it's not exactly what I was hoping for from the first high-tier (5-8) Starfinder scenario, especially one that involves the major season meta-plot. I ran it at high sub-tier using the four-player adjustment, and, except for one hiccup near the beginning, it was also much easier for the PCs than I thought it would be. All in all, I'd mark Reclaiming the Time-Lost Tear as average. 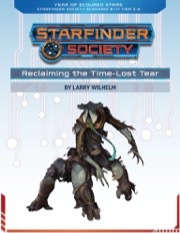 As a sequel to # 1-13 ("On the Trail of History"), this scenario picks up with the Starfinder Society having entered into negotiations with the izalguun (alien inhabitants of a planet in the Vast) over the mysterious golden obelisk that seems linked to the mysteries of the Scoured Stars debacle. The deal is a simple, mutually-beneficial one: the izalguun will provide the Society with the location of the remote repository where the aliens have stored the obelisk and give SFS agents permission to recover it, in exchange for the Society taking it far, far away. The mission briefing is primarily a long (probably over-long) speech by an izalguun about the history of the people, their eventual escape from a planet covered in a golden shield, their re-settlement and conscious choice to put aside technology, and the arrival of the golden obelisk. However, the izalguun representative explains, it has been several years since there was any contact with the repository, and dangers may very well lurk within. The scenario then jumps to the PCs arriving at the entrance to the repository, which is essentially an inverted silo-like storehouse embedded deep in the surface of a heat blasted moon ("Izal-4"). Once the PCs breach the outer airlock, they follow a long, winding ramp downwards several hundred feet before reaching a small platform that ends with the jagged metal struts of a bridge that has obviously collapsed. To make progress, the PCs have to figure out how to span a 75' gulf to an airlock door on the far side of the circular chamber. Ironically, this first challenge proved to be the hardest thing for the PCs I ran it for. None of them had jet-packs, grapple guns, enough skill in Athletics to climb around, etc. Fortunately, after about a half-hour in real-time and a near-decision to just call it quits, one of the players remembered his PC could cast Flight and, by exhausting all his character's second-level spells, shepherd the rest of the group across. I should also mention that the trap (linked turrets) is pretty nasty here and hurt the group worse than anything else in the scenario! Once the PCs get into the complex proper (which consists of an upper and lower level), they're exposed to massive doses of "devolution radiation". GMs should review the radiation rules carefully (especially the benefits of armor and how the damage goes straight to hp), as this is a major aspect of the scenario likely to occur multiple times (hint: keep track of how long the PCs spend on various activities!). The devolution radiation starts to slowly turn the PCs into ancestral genetic precursors, and I thought it was a fun idea that foreshadows the rest of the scenario nicely. Investigation shows that the repository has obviously been neglected, and that the izalguun who are supposed to be its two caretakers are missing. One turns up dead in the bathtub(! ), and some hacking into the computer mainframe shows that the caretakers were suffering from the devolution radiation. One of the caretakers concocted a cure, but was slain by the other before it could be used. After fighting some security robots with a cool trample ability (I liked how they're activated by the PCs accessing the mainframe), the Starfinders might start to suspect they'll be dealing with something quite monstrous soon. The remainder of the upper level has a still-running conveyor belt that leads to a great, classic trap: a garbage compactor that deals up to 32d6 of damage! I never got to enjoy it because of the usual Starfinder problem of the Operative who never fails anything (which makes for a cranky Jhaeman), but I liked the idea of it anyway. There are some other traps and monsters on the lower level, but the highlight is the big battle against a massive (Huge-sized) izalguun that has been regressed into a frog-like form. I appreciated how large the room for the battle is here (around 150' long) as it makes range increments for weapons more meaningful. In addition, the aquatic environment is interesting. I would have liked more information on where the monster starts and a better discussion of her tactics. This behemoth (and her fellows depending on subtier and adjustments) can be returned to normal if the PCs think to use the cure that they'll have found elsewhere. After the encounter, the golden obelisk is there for the taking and the scenario essentially ends. As I've written about with some other scenarios, the MacGuffin here is disappointingly bland, and the conclusion seems rushed. If as much time and effort went into the conclusion as went into the mission briefing, the story-telling would improve dramatically. I think Reclaiming the Time-Lost Tear is a solid scenario for GMs interested in a Starfinder dungeon-crawl. The regressed-izalguun subplot is original and ties in nicely to the PCs potentially suffering from similar effects. In addition, the boons are pretty cool. I'm probably being a bit harsher than the scenario deserves, and it's one in which I acknowledge the limitations of reviewing a scenario after GMing it just once and for a particular group of players. This is the first Starfinder Society that no one in our group cared for at all. It starts off promising enough, with some haunted ruins housing some unknown artifact, but it just never really delivers. If you do things ‘the right way,’ (being real Starfinders, being cautious and thorough, and exploring everything), then it is possible to skip all fights except the optional encounter (even the final fight was essentially skipped; which our group did.). There are several ‘gotcha’ tactics (Traps and radiation that do boatloads of damage with little to no chance of countering them) and the final scene, while a cool concept, is a massive anticlimax that left most our party just twiddling our thumbs. Overall just, not fun. Can't wait to play the first 5-8 scenario! Its definitely cool being part of a campaign from the beginning. Fair Warning: 1 Square = 10 feet. Why is it necessary at this point to have the chronicle to DS IV let alone V? It is reasonable to have a level 7 character at this point but definitely not a level 8. Seeing as you can apply the chronicle of IV to a level 8, where is the rush? You can't even utilize a level 9-10 chronicle. You would apply it and then get to stare at it for who knows how long until they come out with 7-10 scenarios. Which, after attending Paizocon, I suspect will be another several months at least, if not until 2019. Because they have more pressing matters during the 'con season' than making up chronicles that are, as of this moment, useless. Come June 27th, DS IV actually becomes relevant. There is a boon on here that is written as if it has a limited duration but no duration is listed. How long does it last? Assuming you mean the third boon on the list, then the Limited Use entry probably indicated we intended it to be a "Cross this boon off when you do this." however that text didn't make it into print. That being said, given that this requires an expenditure of credits, I'm going to say that you can just ignore the Limited Use on this boon. I'm referring to the first boon that has a duration of "for a short time". OH! That's more flavor text. It lasts for as long as the boon is slotted. Unlike other boons of that type, this particular boon does not get locked-in and can be swapped/removed between encounters. Or not used at all if you have other boons permanently occupying that slot. How is this scenario pronounced? Is this a tear (a droplet shape) or a tear (a hole or split in something)? Where is the cover image? There's only a 'coming soon' placeholder. Some news for the cover image?